Digital high-accuracy temperature sensor (errors of ±0,2°С). Electronic relative humidity sensor (errors of ±3,5%). In addition, the heating controller can use a psychrometer consisting of "dry" and "wet" temperature sensors for measuring the relative humidity. The heating controller automatically recognizes connected sensors. а) enclosed tubular heating element with the voltage supply of 220V and capacity of up to 1600 V.
а) enclosed tubular heating element with the voltage supply of 220V and capacity of up to 1200V. b) highlift pump with the injection nozzle. c) electromagnetic valve with the water control. Measured and controlled relative humidity. Protection against the breakdown of the triac. Built-in real time clock with lithium battery. Counter rotation mechanism passes trays. Download new software from a PC. Port to connect to a PC. Remote management of the incubator at a distance of up to 1000 meters. Time processed by the timer in each position from 1 min. to 999 min. Maximum capacity connected to the output of heating element not more than 1600 V.
Maximum capacity connected to the output of humidifier not more than 1200 V.
Maximum capacity connected to the auxiliary output not more than 800 V.
Maximum capacity connected to the output of the trays turning mechanism not more than 500 V.
Dimensions not more than 130х110х40 mm. Power adapter 220V/12V/1000mА 1 pcs. Set of connecting cables 1 set. 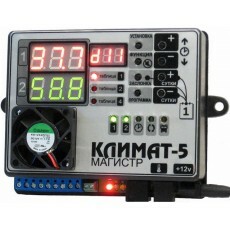 Supports simultaneous connection of up to 4 thermostats "KLIMAT Pro"
Continuous automatic control of incubation parameters (temperature, humidity, rotation of the trays). , the User can view graphs of temperature and humidity in real time. Saving and exporting log data in various formats from all the connected thermostats. Automatic emailing of log data at user-specified intervals. Automatically send SMS messages at user-specified mobile phones.